Beer tweets and the associated blogosphere were awash with talk of Molson Coors new women’s beer last week and as I chuckled unkindly at another tweet making fun of the idea I remembered the contrast between what I thought of it and my excitement over the Adnams Spindrift I’d had at the weekend. I picked it up partly because I’d never seen it before and also because Adnams brew one of my favourite beers, Broadside, but when I lifted it off the shelf I was struck by the fact that it was in a blue bottle. I can’t remember ever having had beer in a blue bottle before and I was seized with a potentially childlike thrill at the idea. Adnams apparently chose the colour and design to evoke sea spray and make the most of the brewery’s coastal location, but speaking to Packaging News*, they also said it was a new take on beer and that they wanted the bottle to have not just a distinctive, but a contemporary feel. Apologies for the picture quality - it must've been the excitement! Whether you like, or are excited by, the blue glass or not I think you’ve got to hand it to them for coming up with something unusual. Surely this 330ml cobalt beauty is just the sort of thing to attract the attention of – and become a talking point for – those who already drink beer and those yet to try it. 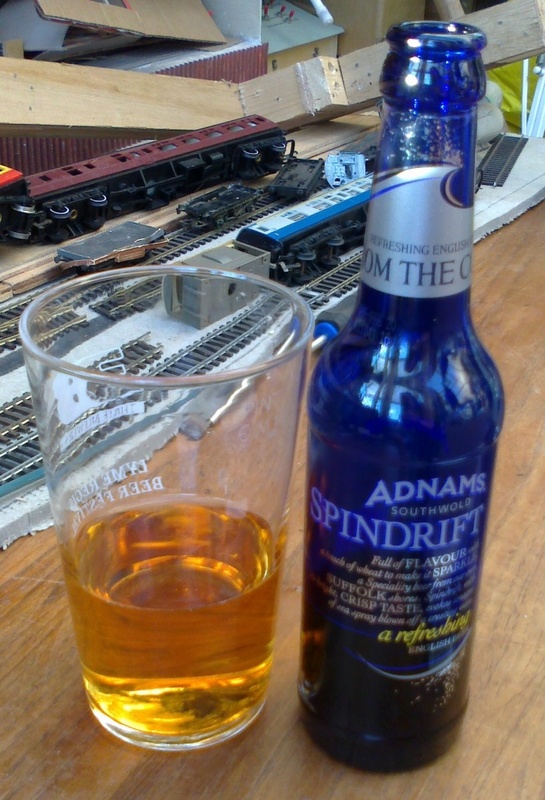 I hope Adnams will be backing Spindrift with the promotion it deserves because I think it could be a real ambassador for our favourite drink; one that blows away the fusty old anorak image like a refreshing wash down with sea spray. The beer itself has a mellow honey flavour, with a rounded sweetness leading to a refreshing, astringent finish. It was somewhat fizzy though and although this made it more thirst quenching it had the potential to translate into being too gassy if you had more than a couple of bottles – but at 5% perhaps you wouldn’t anyway. It seems that beer’s image, or image problem, is on everyone’s minds at the moment. Mark Dredge, who writes the Pencil and Spoon blog, has also just posted on the subject of cheers and jeers for pump clips and bottle labels. Like my own previous post about sexist pump clips, Mark also names and shames some hideous examples of those relying on tired, smutty old puns to sell their beer but, interestingly, also reveals a dislike for associating steam trains and animals with ale. You can read what he has to say here: http://www.pencilandspoon.com/2011/07/branding-my-biggest-beer-annoyance.html but I have to disagree with him about animals because I am always attracted to beer and pump clips featuring birds or bird names. I wonder what he thinks of Spindrift? Thumbs up to Adnams from me though, for another delicious beer and for branding that is worth talking – and writing about. Have to say I tried it a little while back (Easter I think) and thought it was a bit of an acquired taste! Funnily enough so did the barman and, so he told me, post of his customers! Sorry not POST but MOST!